The Boys & Girls Clubs of Greater St. Louis is proud to announce the 2018 Annual Recognition event honorees and Alumni Hall of Honor inductees! Each year the staff, board members, volunteers and supporters are acknowledged and celebrated for their commitment to our Club children. 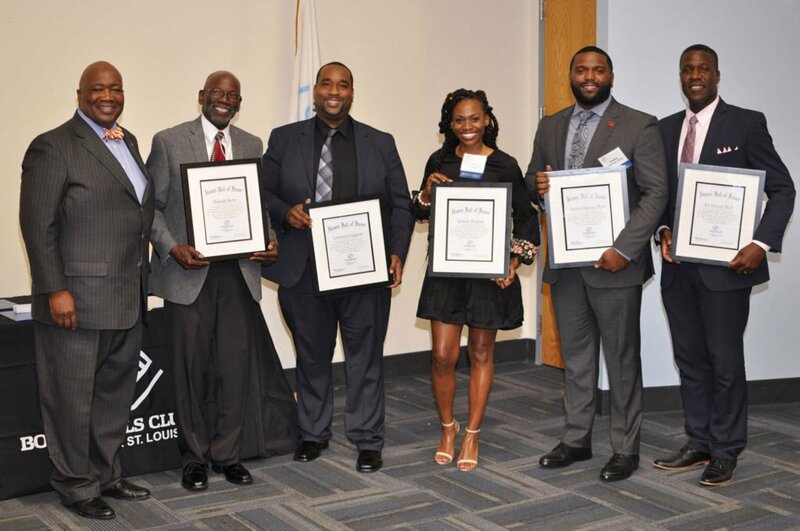 The Boys & Girls Clubs of Greater St. Louis Alumni Hall of Honor inductees are Rolando Barry, Founding Director at MO High Steppers Drill Team; Brittany Dodson, Assistant Women’s Basketball Coach at Morgan State University; Dr. Gralon Johnson, University Innovation Alliance (UIA) Fellow at Iowa State University; Lemont Livingston, Electrical Engineer at Hunter Engineering; and, Dr. Art McCoy, Superintendent of Schools for Jennings School District. The Hall of Honor recognizes outstanding alumni for achievements in their respective fields, commitment to leadership, serving our community’s youth, contributions to the St. Louis community and for living out the mission of the Boys & Girls Club. National Service to Youth Award – Board, volunteers and staff who have rendered long and devoted service (five years or more) to the Boys & Girls Club Movement. National Award of Merit – Individuals and organizations outside Boys & Girls Clubs that have provided outstanding support to local Clubs or the Movement. Carl Woods Volunteer of the Year – Presented to exceptional volunteers who demonstrate his or her devoted service to the Club’s mission. Richard H. Amberg Award – Presented to a Board member whose leadership and commitment has a profound impact on the Club’s ability to achieve its mission. G. Bauman Cabinet of Life Trustees Award – Presented to devoted individuals who have served on the Board of Directors and have completed their Board term, but have a desire to continue to serve in some form or fashion. The mission of the Boys & Girls Club of Greater St. Louis is to inspire and enable youth to realize their full potential as productive, responsible and caring citizens. The Clubs now serve St. Louis youth at ten locations (Adams Park Club, Ferguson Middle School Club, Grannemann Elementary School Club, Herbert Hoover Club, Lee Hamilton Elementary School Club, O’Fallon Park Club, Riverview Gardens Club and Hazelwood Southeast Middle School Club), within two High Schools (Normandy and Roosevelt High School) as well as four additional elementary schools through our Mentor St. Louis Program. The Clubs are open during hours that kids are most likely to need a safe place to go — after school and during summer. We are also a proud member of the United Way of Greater St. Louis.